It was in the years 1968 and 1969 that an orientation towards "heavy" albums set in. Accompanying circumstances such as groups playing two hour sets with loud amps and a light show became part of a musical institution. I was 12 years old and very impressed with all of this heavy, progressive, psychedelic stuff. Strangely, it never occurred to any of us, not even to me or any of my junior high buddies that here and there were people who maybe didn't like some of the groups. Or else they thought the whole idea of the freaks was inane. Of course, there are other perspectives. For instance, Dave Marsh coined the phrase "punk rock" in 1970. This served as a catch phrase for all kinds of garage rock, bubblegum music, surf, hot rod, AM oriented hippie bands like Three Dog Night, Rare Earth, Bubble Puppy and Steam, various one hit wonder singers and bands. Dave Marsh was editor of Creem magazine at that time. I made the gradual discovery in 1971 that the established hippie music scene was a little bit too serious. Rock isn't supposed to be 3rd hour English or a harmonium lesson! The late sixties and early seventies brought many "heavy superstar" acts who were musically excellent. But many of them were overpraised, over promoted, overpaid and overpublicized men. In contrast, the GTOs were six (sometimes seven) nice looking young women who were groupies and rock music followers from L.A. and its surrounding Southern California area. Several of the girls hung around the Sunset Strip area in the sixties. Groups like The Byrds, The Seeds, The Standells, Love and The Doors played there. At any rate, one of the main things that stands out about The GTOs is they were pretty good musically, yet they didn't come across with the seriousness of Presbyterian or Methodist Sunday services. The group consisted of Miss Pamela(Pamela Ann Miller, later Pamela Des Barres), Miss Sparky(Linda Sue Parker), Miss Lucy(Lucy Offeral, later Lucy Mclaren), Miss Christine(Christine Frka), Miss Sandra(Sandra Lynn-Rowe, later Sandra Leano), Miss Mercy Fontenot, aka Judith Edra Peters and Miss Cinderella(Cynthia Wells, later Cynthia Cale-Binion). The GTOs were mentored by Frank Zappa, who grew up in the L.A. suburbs. He was very sympathetic to "the freaks" AKA "The counterculture." But Frank didn't use any LSD and Marijuana- he thought it interfered with the ability to play music and he expected the musicians who worked for him (the various lineups of the Mothers of Invention) to stay straight while on stage or in the studio, hence his mistrust of hippies. Miss Sparky drove a Hudson Hornet in the late sixties. She attracted a lot of attention on the strip when she was out in her ride with The GTOs, done up in their stage outfits and makeup. Miss Mercy came from San Francisco and she attended a Fillmore concert the first night they opened in 1966. She turned on to acid for the first time that night. She was in and out of Juvenile Hall a lot while she was in her teens. Miss Christine and Miss Cinderella shared a room at The Landmark Hotel in 1967. They later brought in Miss Mercy (the Landmark Hotel is remembered as the site of Janis Joplin's 1970 death from a drug overdose). Miss Christine came to L.A. from San Pedro with Miss Sandra. They both lived in the basement of Zappa's house in the mid-sixties. Miss Christine was the live-in nanny for Zappa's two oldest children (Dweezil and Moon Unit) before Miss Pamela took over the position. Miss Mercy came from Haight-Ashbury, which she left out of boredom, saying she "couldn't be a hippie forever." Miss Cinderella was brought into the group by Miss Mercy later on. Miss Cinderella and Miss Lucy both came into the group later and are not featured in all GTO's publicity shots. The group originally called itself "The Cherry Sisters." Later they became "The Laurel Canyon Ballet Company" but Frank Zappa persuaded them to change it to "The GTOs." GTOs could mean "Girls Together Orally" or "Girls Together Only" or maybe "Girls Together Outrageously." The girls were at that time part of a freeform dance troupe called "Vito and His Freakers." They would show up at clubs all over L.A. and if there was music playing they would dance around in a bizarre kind of way. In a recent interview, De Barres said that Vito would actually grab the other dancers and literally throw them about 10 or 15 feet in romantic bravado. Actually, they just wanted to attract attention and they weren't shy about doing just that. They were beautiful ladies and they wore strange, almost fetish-like outfits made for them at Vito & Szou's Art Studio/Fashion Boutique and Crash Pad. Large numbers of people came to see them dance to the music of The Byrds at Ciro's. When The Byrds toured the Midwest, one of their roadies named Carl Franzoni took some of the girls on the road as "touring Byrds dancers." Franzoni eventually became associated with Frank Zappa- he's the Carl Orestes Franzoni mentioned in the liner notes of the Freak Out album. Franzoni moved the girls into Frank's digs in Laurel Canyon before long. As they began to assemble themselves into a rock and roll band, they developed a style which was funny but which some might find it to be oddly disquieting. The performances featured all of the GTO's taking turns singing strange songs, reciting strange poetry, doing obtuse and strange dancing in very weird costumes. It was sort of a takeoff on kind of a Victorian era talent time "see what my daughter can do" tea social, only this time with a touch of the lysergic. Frank was always on the lookout for different and offbeat talent who he could produce and record for his record company he had established with Herb Cohen called Bizarre/Straight. So he started to get the girls ready to record the 17 song LP album Permanent Damage. Zappa produced most of the album. His stamp is on a great deal of the music. Lowell George (a member of the Mothers and soon to be a founder of Little Feet) produced a handful of tracks and played on the album. Other luminaries such as Ry Cooder, Davy Jones, Jeff Beck, Nicky Hopkins and Rod Stewart are all on Permanent Damage too along with various members of The Mothers of Invention. Some of the songs utilize a "Phil Spector" dreamy type sound which actually doesn't incorporate extensive or complicated soloing. Frank's stamp is on much of their music. Seriously, all of us laugh at Frank's lyrics while Frank takes on everything including rock and roll and the hippies in his songs. He was only telling us we're vapid and we'll never leave Disneyland. It isn't so funny if you think it through. The GTOs didn't have an intellectual message. Their act, both musically and visually, was intelligently crafted with very thoughtful and weird song writing. Des Barres says Frank was a genius and he was very good about letting The GTOs exercise creativity and originality. She says The Mothers of Invention supplied the backup instrumentation for their live gigs. The girls acquired such cosmetology school names as "Miss Christine," "Miss Sparky," "Miss Lucy," "Miss Pamela," "Miss Cinderella," "Miss Mercy" and "Miss Sandra" from Tiny Tim. You might remember that Tim was an ukulele player and singer with a female sounding falsetto voice who had two hit records in 1968 with "Tiptoe Through The Tulips" and a remake of Jerry Lee Lewis' "Great Balls of Fire." Tim was on TV a lot back in those days and he sometimes dropped in on the Zappa horde in Laurel Canyon. He addressed all females as "miss." The first time they were announced as being on the bill and being an opener was to promote the release of Permanent Damage. The gig was in December 1968 and also featured Alice Cooper and Wild Man Fisher. It was 2 nights in a row at The Shrine, which seated 6,500 and was a favorite venue of Frank's. Some people have always assumed The GTOs were lesbians, which they weren't. It's true they were great friends with each other and devoted to making the band work. All 7 of them were professional rock groupies who pursued male hard rock performers. It wasn't just sick vicarious thrills on their part. All of them were rock and roll followers since the days of Shindig, Hullabaloo and the top 40. Pamela was an Elvis fan circa 1961. You need to understand that those things represented an irreparable break with the past. Things like that laid the groundwork for something like an indefinable new religion. In that religion, The Beatles, The Rolling Stones and Bob Dylan held sway. But in order for them to hold sway, you first have to take them just a little bit too seriously. The GTOs made good music to be sure, but they weren't gravely serious like a 10 page electric lawn mower manual. They had amazing groupie adventures, contacts and liaisons. Des Barres wrote about these things in her two books I'm With the Band and Let's Spend The Night Together. 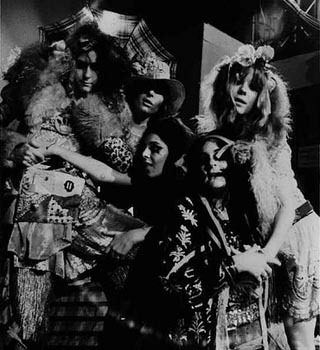 The GTOs were together for two and a half years, then later disbanded. Frank Zappa's Hot Rats was recorded in the summer of 1969 and released on October 15, 1969. People were curious about the album's cover. It showed Miss Christine climbing out of a crypt. Miss Christine earned a revered position in the groupie hall of fame with her list of "rock star boyfriends." And so she earned a list of Rock Star "Dear Friends." Singer Vincent Furnier came to L.A. from Detroit by way of Phoenix in 1967. His band was called "The Nazz" and they played various clubs in L.A.. They were a big success when they played an L.A. club called The Cheetah. In October 1967, the Nazz opened for The Doors. Vincent was Miss Christine's boyfriend for a long time. Eventually, she started seeing Todd Rundgren, a lead guitarist who was also in a band called "The Nazz." It was all talked out and Todd's band kept the "Nazz" name. Furnier started calling his group "Alice Cooper" after the stage name he chose for himself as the ghoulish, makeup wearing, black haired lead singer. Christine had a deformed spinal column and an assortment of health problems stemming from this. Doctors put her in a plaster cast for awhile. She was found dead in a motel room not long after it was removed on November 5, 1972. Sandra and Christine were lifelong friends in San Pedro, California. Sandra succumbed to cancer in 1991 at the age of 42. Miss Mercy was a prolific songwriter. She was very proud of this. Miss Lucy had roles in Frank Zappa's movies Uncle Meat, 200 Motels, Video From Hell and The True Story of 200 Motels. Lucy died in 1991 due to complications from an AIDS related illness. Miss Cinderella died in 2007 under mysterious circumstances. Out of all seven GTOs, Pamela, Miss Sparky and Miss Mercy are still alive. They are all busy with various projects. Pamela is a well-known author with a very interesting website: pameladesbarres.net Miss Mercy lives in L.A. and works for The Goodwill and Miss Sparky is fine but she doesn't give interviews. The GTOs are to be appreciated for audacity supreme. I came across some promotional stuff about the group in 16 magazine when I was maybe 12 or 13. Zappa's Bizarre/Straight label was being promoted heavily in magazines like that. I heard their music on a local AOR FM station in 1970. I think rock's significance could fade somewhat in the coming decades. Fortunately, The GTOs did one extensive album (reissued on CD in 1991 and on audio cassette back in the�80's) and there are the videos I've suggested. So now that you�re curious, check 'em out! I would like to thank Pamela Des Barres for her patient input and assistance with this article.